As you know, diet programs work better for some people than others. I have talked about a lot of healthy diets on this site, and all of them are do-able, but much easier to do together with your own personal coach. In this individualized program the health counselor / coach that will be assigned to you, will help you with whatever it is you need most help with. Think about this for a minute, how will your life be in 5 years if you don't take action now? To sign up, fill out your details below. It most often takes anywhere from 12 weeks to six months, but nothing is a must, it can be quicker or even take longer. No pressure, it's really up to you. You can of course also take the 28 day program if you feel you want to do this as quickly as possible. It is important that you feel very comfortable with your coach. 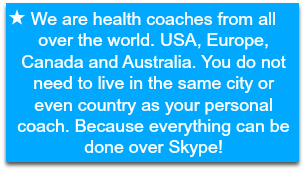 Did you know that health coaching is a little bit similar to the more well known life coaching? In fact, having a health coach can sometime feel like you both have a life coach and a private nutritionist, because it is a nice mix of both! For even more info, contact me. I do think we all know deep inside how we should eat and what foods we should avoid. But finding out what we thrive on and what we react negatively to requires us to pay attention and also be more mindful when we eat. Sending you lots of love and light! Have you ever thought about that our deepest desires and goals are very important to recognize and act upon, instead of pushing them down and saying that I'll deal with them later? You might have had some of your goals for years but never really managed to do something about them? Well, now is your chance! Because believe it or not, nothing is ever too late! And nothing is ever totally out of your reach. If someone can do something, you can do it too!